Inshore has been great the last few days with some nice snook on the flats and a few nice trout around to. The docks to the south around Midway road have been good with soft baits and top water around first light. The reds have been around Queens cove with a few trout mixed in to. The sailfish flats to the south have had a few reds and some pompano here and there still. The snook bite at night has been ok with a few fish around the bridges on live bait. SURF/PIER: The pompano reports improved again this week, with reports coming in up and down the line. The fish seem to be spread out, with reports coming from both north and south of Jupiter Inlet. 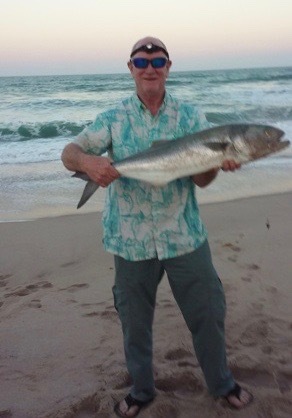 The big bluefish are still hanging out north of Jupiter Inlet. Look for the bluefish to readily strike large popping plugs or heavy spoons during lower light periods of the day. Spanish mackerel have been scattered along the beach as well. The blacktip sharks continue to hang around in good numbers. Overall good surf fishing...just looks like tough fishing conditions this weekend. 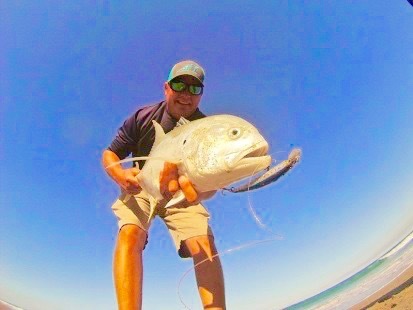 Migrating Bluefish have dominated the catches at the Sebastian Inlet this week. Some real nice fish in the 10 lb. range have come over the rails of the jetties. Blues aren't picky eaters and will hit just about anything thrown at them. A few Spanish Mackerel are in the mix as well and they like to zip around cutting lines with their sharp teeth, like the Bluefish. Break out the bling for those two species, silver and gold spoons work well. Use a wire leader to prevent breakoffs. 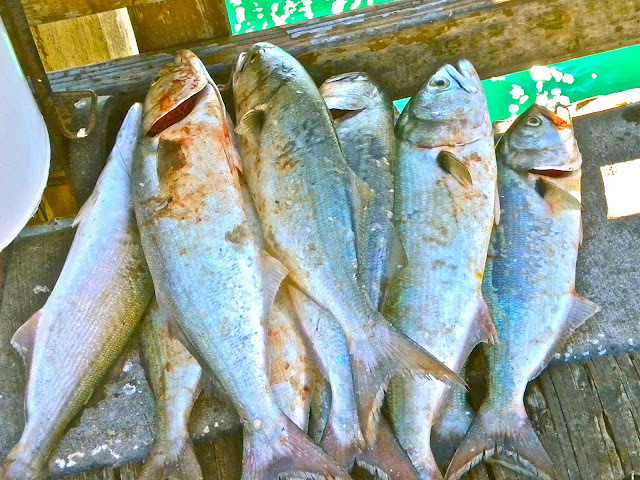 Sheepshead, Black Drum, Jacks, a few Reds and Snook have been active but not in huge numbers. Our angler is 15 year old John Corriveau of Winter Haven. John was visiting while on spring break from Summerlin Academy in Bartow. John was using a two ounce silver spoon to land his big Bluefish. Inshore the snook fishing has been good with a few snook in the inlet and around the bridges with a bunch of fish moving to the flats and spoil islands. 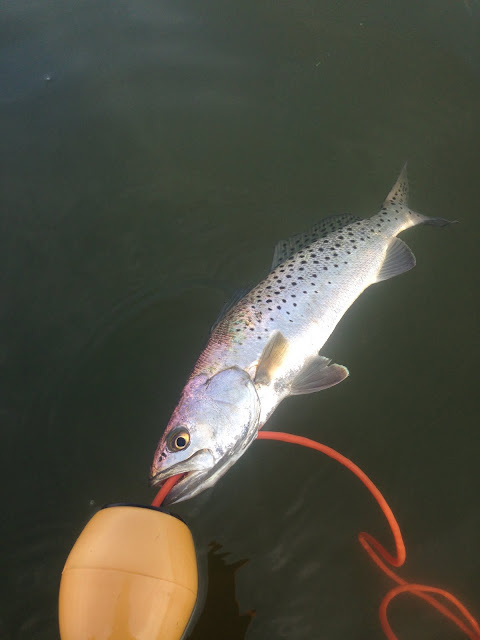 The trout bite has been good to the south around Bear Point to middle cove soft baits and live shrimp have produced well. 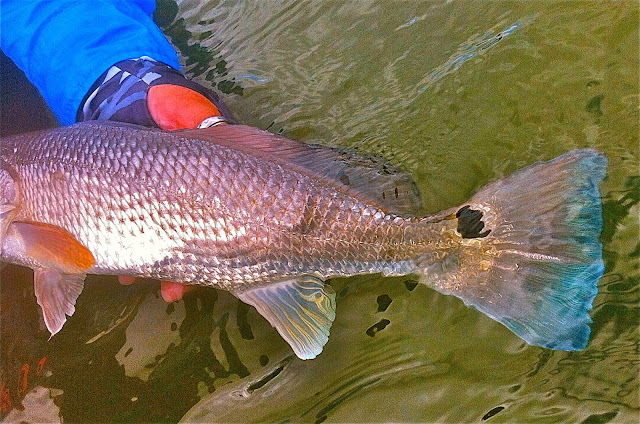 The redfish have been around to the north around Harbor Branch to Vero shores on the west side of the river. March winds continue as usual along the Treasure Coast. Winter also has made a visit to our area to cool things down a bit, but it's better than the blizzard conditions up north. It has been a mild winter in spite of the recent cold spell. Expect more windy days ahead and use them to your advantage when fishing. Plan your trips carefully and enjoy the fishing action! The drum, mackerel, sheepshead, snapper and lots of jacks will keep your rods bent all morning. Snook fishing has been great around the jetties and the big mackerel have arrived. The usual winter fish like sheepshead and drum continue to bite around structure. Winter can always give you challenges with the windy weather, but the fishing is always good if you use the winds to your advantage. It's another gorgeous day at the inlet. Winds are blowing out of the South-Southwest at 1 mph with gusts to 5 and the water has a light chop. These great conditions won't be around for long. A front is moving in that will bring us increasing winds and building seas that will produce hazardous boating conditions through the weekend. NOAA has a small craft advisory from 5:00 p.m. Thursday through Saturday morning. Always check the NOAA forecast prior to boating as conditions can change quickly. Sarah Sams at the Sebastian Inlet Bait and Tackle Shop reports that Bluefish remain the dominant species and some real nice fish have come over the rails. Using a heavy leader is recommended when targeting Bluefish to avoid cutoffs. A few Sheepshead are active and will hit any crustacean or jig tipped with the same. We're seeing sporadic hits of Pompano for anglers fishing from the beach using live sand fleas and today would be a great day to get out and try your luck. Our photo today is courtesy of Luke Vila of Kissimmee. Luke and his girlfriend Lauren Mills fished the inlet shoreline and Luke admits that Lauren out-fished him! Lauren landed several nice fish including the Bermuda chub that Luke is holding in the photo. This Chub took a shrimp's tail whose body had been bitten off prior. These fish are normally vegetarian but will take cut baits at times. They aren't very good eating but they are fun fighters. This fish was released to fight another day. We have a real nice day at the inlet. Winds are blowing out of the North at 9 mph, gusting to 14 and there is a moderate chop on the water. NOAA has a small craft advisory in effect for seas. Seas will slowly subside through mid-week then start to build again Thursday morning. It's all about the Blues at the inlet. 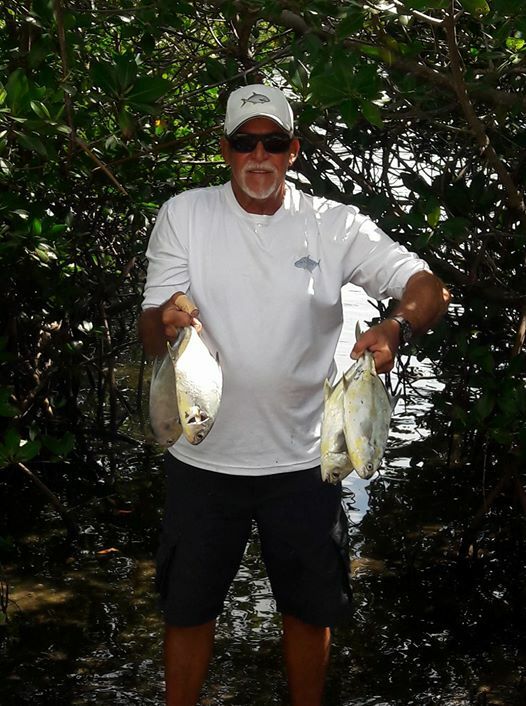 This weekend the bite was fantastic according to Tommy Turowski at the Sebastian Inlet Bait and Tackle Shop. Large schools of big Blues were making their way in and out of casting range from the jetties. Blues in the 10 lb. range were not uncommon and one angler landed one that was 17 lbs.! Silver spoons work well for Blues but they will hit just about anything, live or artificial. They love the bling, use shiny lures and a heavy wire leader to avoid break offs from their razor sharp teeth. Along with the Blues, quite a few Sheepshead, big Jacks, Spanish Mackerel, Reds and Snook were active over the weekend. INSHORE: Snook fishing remains very good inshore right now. The snook are biting live shrimp at night around bridges and docklights, and live mullet around docks and seawalls during the day. The snook maybe a bit sluggish after the front so be prepared to slow things way down. Some big jacks inshore to pull on. A noisy topwater plug along a seawall is a god way to go to get the big jacks fired up. 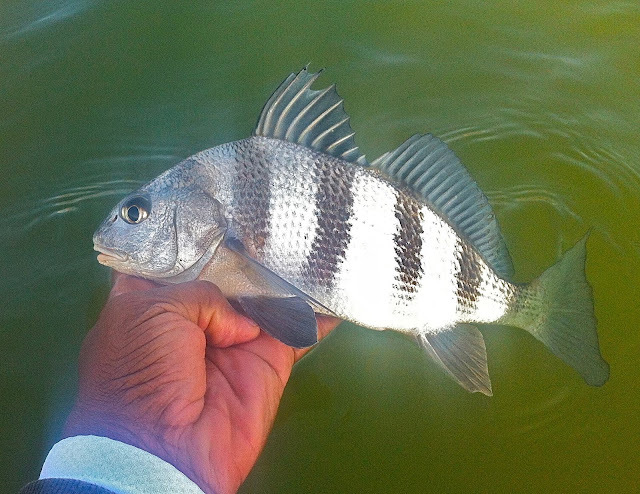 The Sheepshead have been biting around area bridges and boat docks on live shrimp and sandfleas. Overall pretty good inshore fishing right now. 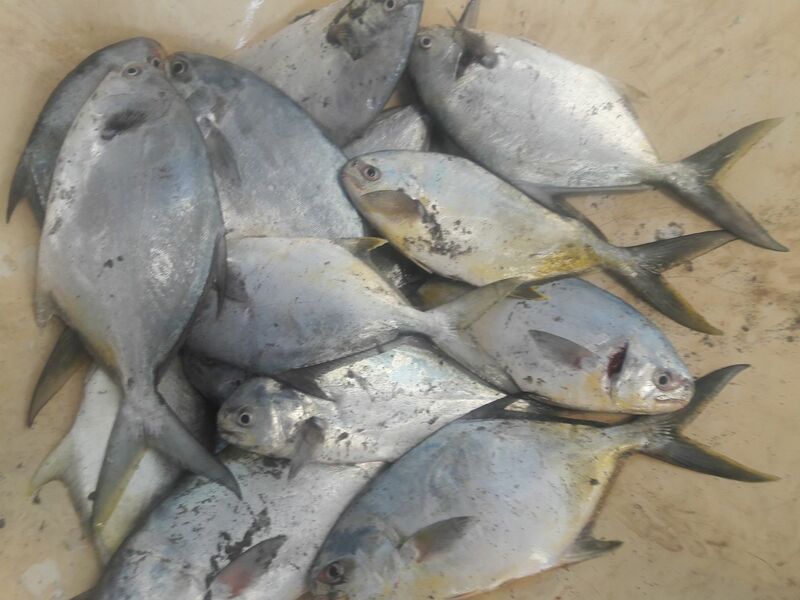 SURF/PIER: Pompano fishing was good this week; both from the pier and beach. Doc's Goofy Jigs are catching them form the pier, while sand fleas and clams are the way to go from the beach. Some large bluefish around right now. Spoons and topwater are a good choice for the bluefish. Scattered spanish mackerel around. Lots of sharks along the beach right now, including some full size ones! Lots of good surf fishing right now! 03-17-17 TGIF AND HAPPY ST.PATRICK'S DAY! It's warming up and we have a beautiful day at the inlet. Winds are blowing out of the North-Northwest at 13 mph, gusting to 17 and there is a moderate chop on the water. Conditions will continue to improve through tomorrow until a cold front moves in Sunday morning which will create poor to hazardous boating conditions. Always check the NOAA forecast prior to boating. Tomorrow should be a good day to get out and do some surf fishing. Pompano are migrating and like to run fairly close to shore in the troughs. Sheepshead, Snook, Reds and smaller Jacks are being landed from the north and south jetties. Pompano are also being landed on the flats along with some Spanish Mackerel and good sized Trout. Get out and wet a line this weekend! Our anglers of the day are Dave Vermilye of Sebastian and Craig Davis of Burton, MI. Dave and Craig fished the north jetty morning fishing, when they both landed the beautiful Snook in our photo. Both Snook measured 31 7/8" and were just in the slot. The men landed both fish on live shrimp. INSHORE: Small craft advisories have made inland waters very rough the last few days. 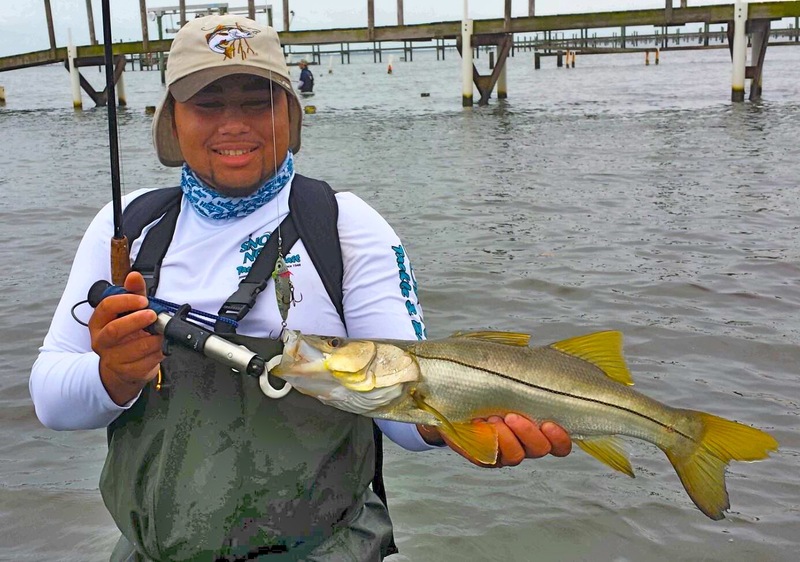 Snook are starting to work there way out to the inlets ,but the recent cold weather could set them back. 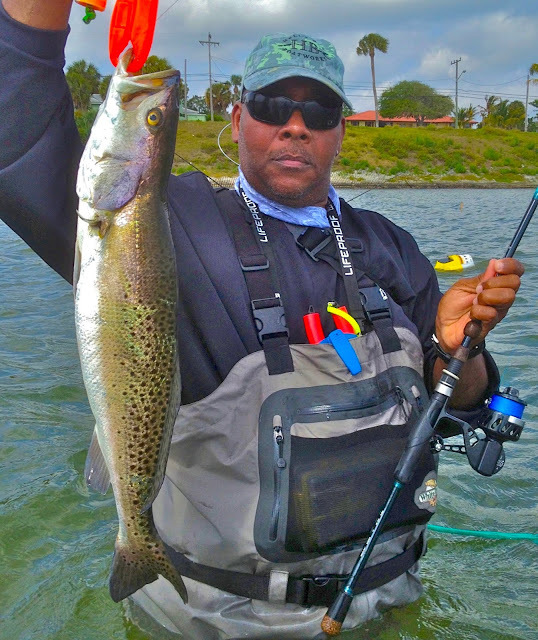 There are a few trout being caught in Ft. pierce near the spoil islands north of the bridges. Great artificial baits to use include Monster 3x shrimp rigged weedless and DOA shad tails rigged on jig heads fished in 2-4′ feet of water. We have another chilly morning at the inlet. Winds are blowing out of the West-Northwest at 9 mph, gusting to 12 and there is a moderate chop on the water. Poor boating conditions today will gradually improve through Saturday. Another cold front is predicted for Sunday morning which will give us poor to hazardous boating conditions again. Tommy Turowski at the Sebastian Inlet Bait and Tackle Shop reported that yesterday some nice Snook and Reds came over the rails of the jetties, quite a few Sheepshead were landed on shrimp and one real nice Trout was landed by one of the inlet regulars. Our photo today is courtesy of Cindy Miguel. Cindy's husband landed this huge C/R Red. The big Red was released right after the photo. Brrr....button up anglers, we have a very chilly, windy morning at the inlet. Winds are blowing out of the West-Northwest at 14 mph, gusting to 21 and there is a moderate chop on the water. NOAA has a small craft advisory in effect through 4:00 p.m. today. Hazardous boating conditions will continue through today then begin to gradually improve through Saturday. Always check the NOAA forecast prior to boating as conditions can change very quickly. Will this cold front invigorate the bite? To find out, bundle up and get out there and toss a line in the water! We usually see the fish become more active with a change in weather pattern. Sheepshead are the dominant species along with some nice Reds and Snook. Pompano, Spanish Mackerel, Trout and few other straggler species are being landed on the flats. Our angler of the day is Christina Clyburn of Winter Garden. Christina and her husband Randy were fishing the north jetty when she landed the beautiful Permit in our photo. This nice fish measured 21.5" to the fork. Christina was using live shrimp to land her fish. We have a beautiful, crisp morning at the inlet. Temperatures are in the low 60's this morning and winds are blowing out of the West-Southwest at 7 mph with gusts to 17. The water is choppy and NOAA has a small craft advisory in effect through 4:00 p.m. today. Always check the NOAA forecast prior to boating. The bite has been sporadic at the inlet. We are seeing bursts of activity then lulls. Yesterday some nice, big Reds came over the rails of the north jetty along with Snook and Sheepshead according to Tommy Turowski at the Sebastian Inlet Bait and Tackle Shop. Tommy reports that live shrimp are doing the trick for most species right now. The flats are holding some good sized Trout, Spanish Mackerel and Pompano. Our angler of the day is Birhan McCalla of Palm Bay. Birhan landed the nice Sheepshead using sand fleas from the north jetty. It's a gorgeous day at the Sebastian Inlet! Winds are blowing out of the South-Southwest at 4 mph, gusting to 7 and there is a light chop on the water. What a great day to get out and do some boating and wet a line. Conditions are predicted to deteriorate, just in time for the weekend. Always check the NOAA forecast prior to boating. 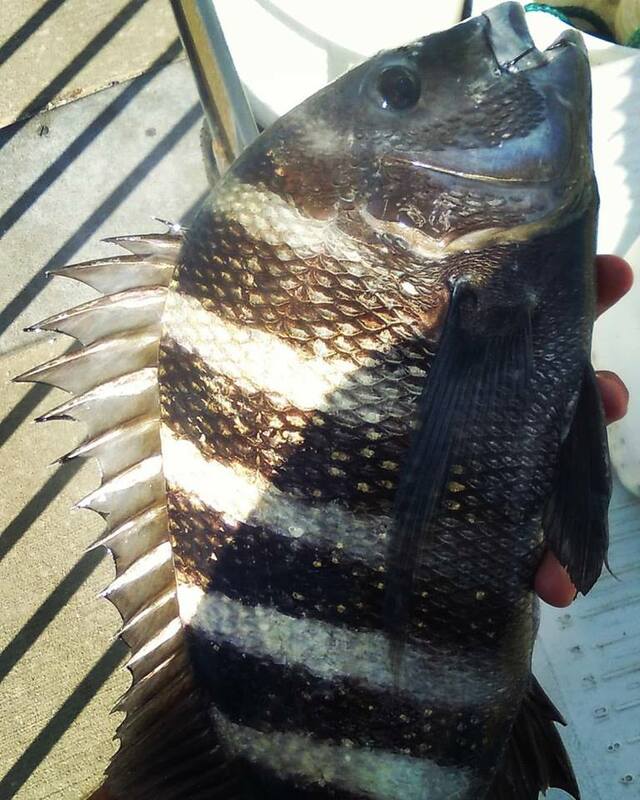 Sheepshead, Snook, Reds, Blues, Black Drum and Flounder have been making appearances at the inlet. Every now and then, we see an occasional Permit, Pompano, Spanish Mackerel or nice Trout come over the rails of the jetties. The flats are holding some Pompano, Trout and good sized Spanish Mackerel as well. Our angler of the day is John Berry of Melbourne. John landed the huge 40" C/R Snook using a bucktail from the T-Dock. This big boy put up one heck of fight but John prevailed. John had a couple of other hard strikes and other anglers were pulling in some large Jacks. Inshore there where a few people that battled the wind over the weekend and found a few reds and some nice trout to the north of Ft Pierce around Queens cove to round island top water and soft baits produced well on the outgoing tide. The where a few reports of some nice pompano in the inlet on the incoming tide. The snook fishing has been good around the bridges with live bait and a few fish on jigs. March will be a month of change. With the warmer weather, tarpon will be starting to show up around inlets and bridges. Snook fishing will be hot on the beach and getting there early will make the whole difference of catching and not. If it rains a lot during the month, go to the St. Lucie Locks to see if the water is running. If so, the snook bite will be great. I always use plugs from Yo-Zuri but you can catch them on soft baits and jigs. Best location bets are Walton Rocks and St. Lucie Locks. Huge jack crevalle will be in the river but most will be caught on the beaches. They start to spawn offshore and you catch these big boys on topwater plugs, spoons and even dead bait. Look for incoming tide to fish and they will be at your feet. Best location to go to is hands down Walton Rocks Beach. This beach has a great reef and has the outflow from the powerplant. Bluefish will be making their last showing and they will be hungry. Cut bait and spoons will work great and fish high tide. Best place to fish is Hobe Sound Beach and get there early and walk about 100 yards to the left and look where the reef comes close to the beach. Tarpon fishing will start to get good and there is no better place than the Roosevelt Bridge in Stuart and using threadfin as bait can’t be beat. Fishing night time will give you a better chance to get on these fish. Fish moving tide and where there are lights. Use heavy gear 65-pound braid or more, and number 9 circle hook tied to 80-pound leader. Redfish will be good too with little ones around the flats from the west side of river to the east side. Bull redfish will be at the Sebastian Inlet, the hands down best place to have a chance at catching these big fish. Pinfish, pigfish and mullet work great, but jigs, plugs and soft rubber baits also work great with moving tide. Get there early because crowds are crazy, and fish the south side of the inlet on the beach for some great action. 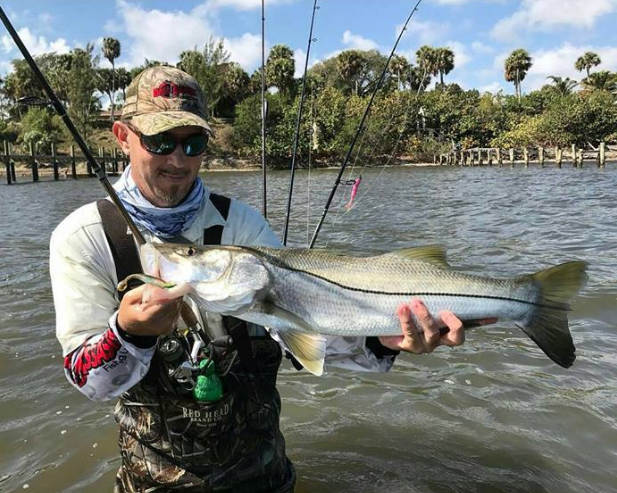 In the Jensen Beach area, the snook bite has been really good. Using live pilchards around 3 inches in length has produced excellent results around area bridges. The pompano bite has been decent along the Jensen Beach Causeway by the Relief Bridge on incoming tide. For trout, the waters around Bear Point have been fairly consistent. Along the beaches in the Jupiter area anglers are taking keeper snook using lures in the churned up water. In the intracoastal, near the Catos Bridge, the fishing has been good for snapper, although most have been juveniles. Further up between markers 42 and 46 the fishing has been steady for sheepshead, croaker and black drum. Around the Boynton Beach Inlet, mangrove snapper, tarpon, bluefish, jacks and a few snook are being taken on live shrimp or cut mullet. 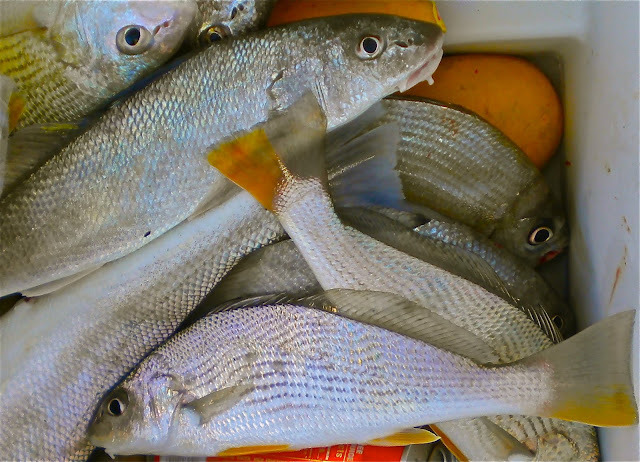 In the Intracoastal around Boynton Beach, anglers fishing the various flats and around the docks, have been getting mangrove snapper and sand perch on cut shrimp, sea trout and snook on both top water plugs and rootbeer Cotee jigs. They’ve also been getting small blacktip sharks in the same areas on any kind of bloody bait. 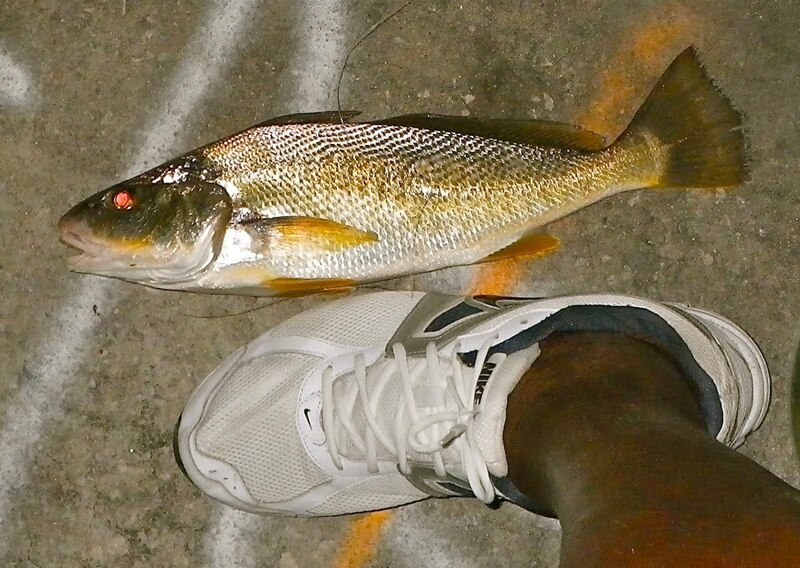 At the Lantana Bridge anglers have been reporting good action on sand perch and small black drum. On the lake, the outside grassline has been best if it’s not too dirty to fish. With this weekend’s approaching strong winds the fishing will be challenging. The best bet will be to find a place to hide and look for clean water. Shiners are still working great. If going with an artificial bait, try using chatterbaits, spinnerbaits and swim jigs.